His family paid tribute, saying he was "the best big brother" who would be missed by many. 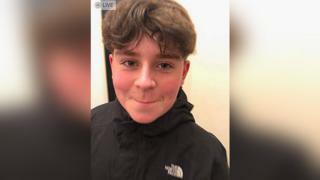 Gwent Police is treating the boy's death as unexplained and specialists are working to determine the exact cause of death. Det Ch Insp Sam Payne said: "Although we await official medical confirmation of the cause of death, one of our main lines of enquiry focuses on illegal substances being a contributing factor. It comes after Tatum Chynene Price, Carson's mother, posted a comment on Gwent Police's Facebook page pleading for help finding whoever supplied her son with drugs. In a statement, his family said: "Carson was bright and caring, kind and loving, he was a cheeky little boy. A local councillor expressed his sympathies with Carson's family, adding that he hoped his death would deter other youngsters from taking drugs. "If it is a drug-related passing, I just hope that young people realise that you shouldn't really deal with drugs," Councillor Martyn James said. "You have got to leave it alone because unfortunately - we know all too well now - we have lost a young man and his life has gone." Chris Parry, head teacher at Lewis School Pengam, said everyone at the school was "devastated at the terrible news". A crowd-funding page set up to raise money towards a party to celebrate Carson's life has so far raised about £600.